Ever since I started writing the first edition of The iPad for Photographers, one aspect of the process has been a sticking point: image backup. I know, that sounds like the most boring part of being a photographer, but it’s also vitally important. Importing photos onto the iPad for review is one option, but it takes up valuable storage (and digital camera files aren’t getting any smaller). That also means you have just one set of image files, unless you use the SD memory cards you originally captured the photos onto as backup (which is also a good idea). A number of companies have made hard disks that incorporate Wi-Fi radios, primarily as a means of storing lots of media (movies, mostly) and stream them to the iPad and not take up the device’s storage. The Seagate Wireless Plus also added the ability to copy photos from the iPad to the drive, but its implementation is pretty basic and time-consuming: You need to import photos to the iPad, and then copy them to the drive. All this is lead-up to a new product that makes the whole problem less thorny. The WD My Passport Wireless is a portable, battery-powered hard disk that adds one crucial element: an SD card reader. With this addition, you can dump the contents of a memory card while you’re shooting with another card, then connect to the drive on your iPad and review your work. My full review at Lynda.com is here: Review: My Passport Wireless for the Traveling Photographer. The third and last article in my iPad Photography in the Field series at Lynda.com is now up! It’s an extra long entry that covers how to use the iPad to sort your good photos from the not-so-good ones. It also explains how to apply essential metadata like keywords and IPTC information to your photos so you don’t need to do it later when you’re back at the computer, saving a ton of time. 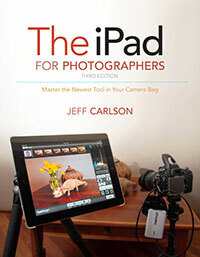 Read the article here: iPad Photography in the Field: Rate, Tag, and Export Photos. The second article in my series at Lynda.com about using an iPad in the field for photography is now posted. (You can read the Part 1 here.) This one takes us out into the field itself, where I discuss the advantages and the how-to of reviewing photos on location. I talk about using the Apple camera adapters and also wireless options like the Eyefi, which lets you review shots on the iPad while you’re shooting. I also offer ideas for recording location information and getting on-the-spot model releases easily. Premiere photo site 500px has just published an article of mine that takes a high level overview of what an iPad can do for photographers: How an iPad Can Improve Your Photography. 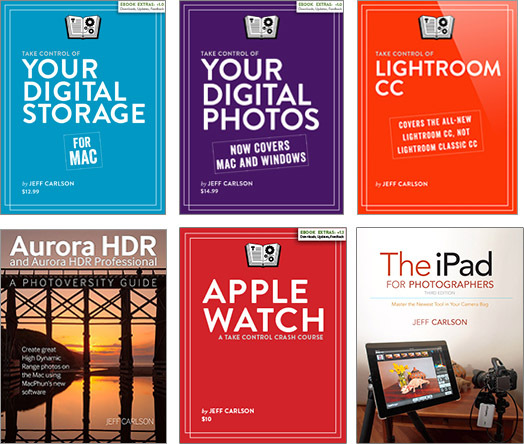 Think of it as the ultra-compact version of my iPad for Photographers book, covering the options for using the iPad as a portfolio, importing photos to the iPad and reviewing them in the field, adding all-important metadata, editing the shots, sharing images, and more. I’m actually quite excited to appear on 500px, not only because I like what the company is doing, but because the people who post and read at the site tend to be extremely talented photographers. It’s fabulous company to be in.